MARK ANTONY AND OCTAVIA, (40-32 B.C. 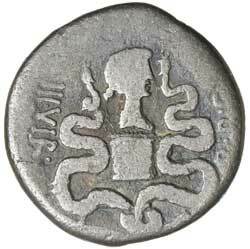 ), silver cistophorus, Ephesus mint, issued 39 B.C., (9.86 g), obv. 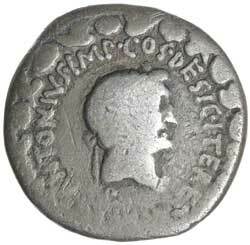 laureate head of Mark Antony to right, around M ANTONIVS IMP COS DESIG ITER ET TERT, rev. Octavia head to right on cista mystica between two interlaced serpents, III VIR R P C around, (S.1412, BMC 133, RSC 2, Syd.1197). Good - very good and scarce.